← Meet our abortion pill baby! In all of the years we have ministered on these sidewalks, for some reason I had never noticed that it was an olive tree before. It had never grown any fruit that I had seen, so I hadn’t really thought about it. But now this half-dead olive tree caught our attention, and I couldn’t help but be struck by the symbolism. I thought of what Jesus did when He found a fig tree without fruit. He cursed it, and it later withered up and died. But instead of cursing the olive tree, I thought we should make a declaration more consistent with our hope that this place of death will be transformed into a place of life. And so I declared that this tree would bear olives, and that this fruit would be a sign of God’s transformation. It had been our hope and belief at the time that the abortion chamber would close by the end of 2008, so I hoped to see a sign soon. During the weeks and months that followed, I looked at the tree from time to time, hoping to see some fruit. But it was still barren and half-dead. “It’s an olive tree,” she said. “I know,” I replied. I thought of telling her how I had declared that it would bear fruit. But I stopped myself, thinking that it would just make me look stupid. I ran over to look, and sure enough, there they were. 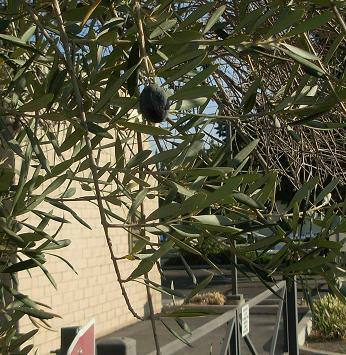 The tree is still half-dead, but it is growing olives! Some people seem to think that this is not very amazing, because apparently it is possible to cause a barren olive tree to bear fruit by pruning it in a certain manner. But we have made no attempt to prune the tree, nor have we encouraged the gardeners in any way to prune the tree. I don’t think it is coincidental that we noticed this fruit at the start of this 40 Days for Life campaign, almost exactly one year from when I first made that prophetic declaration in prayer. God is transforming this place of death into a place of life, and He wants us to have faith that He can complete the transformation! Can you believe with me that it will be accomplished? Tim I also noticed the olive tree, also and found it amazing that I had never noticed it and that it was placed directly under where the girls go into the “jaws of death” . 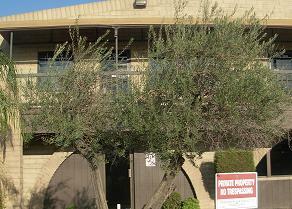 I thought it was interesting that on the whole property was this lone half dead olive tree. I knew there was a significance, but wasn’t sure what. I am so glad God showed you this wonderful sign of his love and faithfulness. I’m sure there will be more revelation and comfort to come. What comes to me is that we are grafted into His family. And of course Jesus wept before the crucifiction in the olive garden, knowing he was to bear our sins. The fruit is surely a sign of LIFE! Of course oil (which is crushed from the fruit) is a sign of the Holy Spirit. God is good!